Monroe Crossings Park is located on the corner of SR63 and RT4 in Monroe, directly off of SR63 on Crossings Blvd. On I75 take exit #29 (Rt.63 aka Hamilton-Lebanon Rd.) towards HAMILTON/MONROE - go 4.4mi to left on Crossing Blvd. - go 0.1mi to right into park. Address below is close, the street is new and yahoo/google/mapquest maps cant get to that exact location. Monroe City Building Community Room, on Main Street(Cin-Day Rd.) up from Rt63/Rt25(Cin-Day Rd.) intersection. The Field Sports Arena(indoor soccer facility), across from Subway close to I75/RT63. Used for Spring signups. Fields are located behind the Carlisle Intermediate School on Jamaica Rd. (last school on the right). Park in the High school parking lot between/behind the school buildings. Drive north on I75 until you reach State Rt. 73. Head east thru Springboro and Waynesville; cross over Caesars Creek; and continue into Harveysburg. Once thru Harveysburg, you'll see Harveysburg Rd. Turn left, and the fields are in the park that is directly behind the firehouse. Harveysburg has its own zip of 45032, but mapsites dont know, 45068 is Waynesvilles. Drive north on Interstate 75 to Route 123 (Franklin exit). Turn left and drive west a few miles. Franklin Park will be on the right. Drive west on Route 63 to south Route 4. Drive south on Rt 4, about 8-10 miles, until you reach Symmes Rd. Turn right and head west. Turn right on River Rd (about 3 stop lights) and then left at Forest Lake Lane. This is the entrance to the park. The fields are at the Southeast corner of Irwin-Simpson Road and Snider Road. Head south on Cin Day Road to Yankee Road. Turn Left (west) on Yankee Road go .5 miles; turn in just before YMCA. Park is behind YMCA. Drive east on Route 63 towards Lebanon. Cross Route 741 and continue traveling about 2 miles. As you start down the hill, McClure Rd will be on the right - turn. Drive thru the stop sign and continue about 1 mile, until you see the fields on the left. Located just south of the intersection of Fallis and Rich Roads. Soccer Fields are in the back of the park. Access Rich Road from Fields Ertel to the north: Take Fields Ertel past Lebanon (Columbia) to Rich. Turn right on Rich and Phillips Park is located just past the high school, on the left side of the street. From I-275: exit at the Loveland-Indian Hill Exit, turn left at the bottom of the off-ramp. Continue on Loveland-Madeira Road. Turn left at the 3rd light - Lebanon Road. Take Lebanon up the hill past Loveland Middle School to next light. Turn right on W. Loveland Avenue. Continue to the next light which is Rich Road. Turn left on Rich. Phillips Park will be on your right side. You should be able to see a baseball field on the right as you approach. The entrance to the park is before you reach the basbeall field. Follow the road back to the parking lot. -Branch Hill Loveland Rd. From downtown Loveland, turn right on Broadway and follow straight up the hill. Turn right on Hanna Av. Follow Hanna Ave. around to right and down hill. Riverview Park is located on your left across from bike trail entrance. I-75 Take exit #22(Tylersville Rd.) turn east towards MASON - go 4.0 mi. Turn left on S MASON MONTGOMERY RD - go 0.2 mi. Park is behind Mason Community. Park entrance is between Mason Community Center and Mason Middle School. Rt63 west to 741 south to 42 south toward Mason. Park is approx 1 mile on right on top of hill. Drive I-75 north to the Middletown exit, Rt. 122. Head west, passing Towne Mall and Danberry Cinemas. Stay in the right hand lane, and continue in the right hand lane when the road splits into Grand Avenue and Rt. 122. Go thru the light at Marshall Rd., and turn right at the next light - the entrance to Jacot Park. From Interstate 75, drive west on Route 63 to Route 4. Turn right on Rt 4, heading north. Drive about 5 miles into downtown Middletown. Turn left on Reinartz Blvd - Post Office is on the southwest corner. Drive one block to the light (Main Street/Tytus Ave), and turn right. Park is one block on the left. 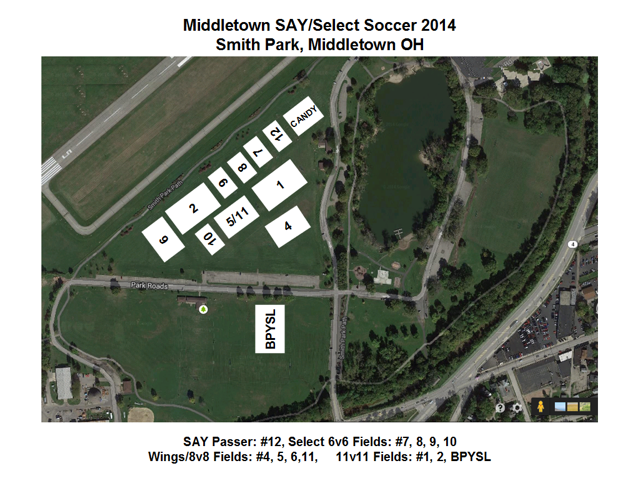 All MVS games are on fields #1,2 & 3. East side of the pond. You will come to the light where Rt. 73 ends in Oxford - turn left then immediately turn right onto Spring St.
more lights and at that point it becomes Fairfield Rd. If you get to the airport, you've gone too far. From Middletown area. Go west on St Rt 73. Cross Great Miami river. At second light turn left. (This is S. Miami St or Hamilton Ave). Turn left onto Pierson Rd. Fields are at end of road on right just after the Walnut Grove swimming pool. Address is 901 Pierson Rd. From Rt. 4 take Rt. 725 West into Germantown. (Road is called Market Street in Germantown). Go thru the center of town. As you start to leave town (headed West) turn left onto Astoria rd. Soccer fields are on the left at Kercher Park. Take St Rt 73 East thru Springboro into Waynesville. Turn North onto St Rt 42 in Waynesville. Go about 1/4 mile north on 42. Turn right onto Corwin Ave. Bowman Park will be on the left about 1/2 mile. The Yahoo Map star is not correct, the park doesn't have an address and there is nothing between Corwin and Waynesville. I-75 south to Exit 22, Tylersville Rd. East on Tylersville 1/3 mile to Cox Rd. Right (south) on Cox Rd 1 mile to Hopewell Middle School and Elementary on the left. The game fields are directly behind Hopewell Elementary. Take I-75 to Tylersville Road, exit 22. Turn East. Go about 1 mile to Cox Road and turn left (north) field entrance is one half mile on the right. Follow Galbraith Rd road for a short while. Turn right onto Springfield Pike (RT 4). dead end into Oak Ave. Park is on Oak Ave.